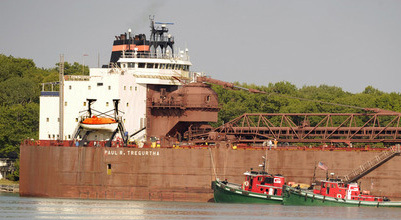 Tugs MISSOURI and FLORIDA of The Great Lakes Towing Company freed the PAUL R. TREGURTHA early Thursday morning. The 1,013 foot Great Lakes self-unloading bulk carrier ran aground Wednesday morning in the Rock Cut channel in Sault Ste. Marie, Michigan. The Great Lakes Towing Company’s Captain Mike Patterson, celebrating his 25th year of career employment, lead the assist aboard the MISSOURI.